Your job is to investigate applications for fluid power systems. To demonstrate what you have learned, you will answer the questions included here in your exercise book. You will also complete one of the activities described at the end of this investigation. During what decade was hydraulic power first used for farming? How many tons can a 40-ton hydraulic crane lift? 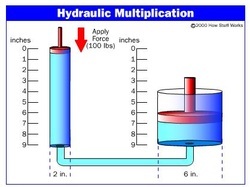 Why does an air bubble in a hydraulic system reduce the system’s efficiency? What are the names of the hydraulic tools used in the Jaws of Life? How many hydraulic cylinders are used to move the Animatronic Spinosaurus? Which type of power is used to lift cars at auto service centers, hydraulic or pneumatic? In what part of a pneumatic nailer is air from the compressor stored. To what part of the user’s body do most pneumatic-nailer injuries occur? questions. You may use additional sites if you wish. Be sure to keep a record of any sites you use. explains how cranes used for construction operate. explores how the set of hydraulic tools called the Jaws of Life are used in rescue operations. explains the operation of heavy construction equipment, such as cranes and backhoes. This site also includes video clips. explains the operation of animated dinosaurs and other large creatures used for entertainment. Wessels Living History Farm: Farming in the 1940’s—Hydraulics tells how hydraulic power revolutionized farming. HowStuffWorks: How Nail Guns Work explores how automatic nailers are powered, including those with pneumatic systems. The site also includes safety tips. About.com: General Elevator and Escalator Information talks about the history of these devices. Several activities are described below. Complete one of these activities (your choice) to demonstrate the understandings you’ve gained by going on this investigation. Read the following online article then write a short report about it. People with disabilities may have trouble getting up from a chair. Design a fluid-powered chair that will help them stand up. Make a finished drawing or model of your invention and label the parts. Include a paragraph explaining how it works. Research pneumatic nailers to find out how they should be maintained. Is any special care required? Report your findings to the class.